I'm sure there are many of you out there who have valuable skills in these areas. Let's get to know each other and collaborate in our spare time to contribute to freethought. I'm no designer or programmer, but I've managed to use the magic of PHP and the technical expertise of Sundeep to set up Nirmukta.com and this forum. But we need better trained people in future initiatives. For example, this is the limit of my creative abilities. Obviously we can find people who are good at graphics design to volunteer a couple of hours for the cause. hi ajita. am a graphic designer and u can send me the brief. i dont do web development or programming. I am a web developer, though at the server side I'm familiar only with Java and not PHP. But that shouldn't be a problem. I'm sure I can learn PHP in a few days if needed. Kitty's Carvaka site should be ready soon, and Dr. Bala and Shobhit are readying theirs. Once those are ready we could use the ads on them to bring people to the forums. (30-Mar-2010, 08:18 PM)Lije Wrote: I'm sure I can learn PHP in a few days if needed. Lije, that would be really useful. PHP with CSS is the name of the game when it comes to dynamic content like blogs and forums. We have many projects coming up where we need skilled developers. In my professional life I am into c/c++, but I am geeky enough to find my way around any kind of hurdles that I encounter when I do any web related stuff. I can do some imaging stuff also. I am a beginner in GIMP. Here's the finished ad. Click for full view. Amazing work, Bala. 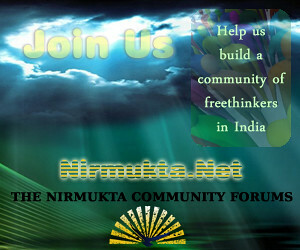 Your design has been inserted as a rotating ad on the sidebar of nirmukta.com. At the next Media Committee Meeting we will discuss inserting it into the other websites as well. Just to give you a heads up. I've set up my own hosting site on GoDaddy which is Windows and .NET based and I'm happy to host and develop sites there for people if they wish. PHP is great because of it's flexibility and it can work on both the Windows and Linux environment. The downside to PHP is that the development time is generally much longer unless you have someone who has a few years expertise in it as well as a good understanding of OO principles. I'm slowly getting my own personal site set up there now (still nothing there). (02-Apr-2010, 06:34 AM)bala Wrote: Here's the finished ad. Click for full view. Bala. Really loved your work! We could use a nice banner for the Carvaka site :-). While I'm sure I'm no match for those of you with professional expertise, I can lend CSS and (some) PHP help wherever needed. Including troubleshooting CMSs and forum platforms, mostly to just take the burden off and get things moving faster. Also, graphic help too. While haven't done much work in years (since CS2) I was thinking of getting back to this childhood hobby soon enough. Will make a few banners soon. I am mainly a programmer (Python, C/C++, some PHP) and can help with maintaining websites, and even setting them up. I am familiar with the Python Django platform. I also have about 2 years of experience as a server administrator (at CSA dept, IISc) for Linux machines. I would love to help out if expertise in these areas is required! Just send me a PM/email! I would also advocate the use of Free and Open source software, as being free thinkers we should assert our freedoms in software too! (14-Jun-2010, 09:48 PM)donatello Wrote: I would also advocate the use of Free and Open source software, as being free thinkers we should assert our freedoms in software too! I see that you worship Saint IGNUcius. If I'm not wrong, Nirmukta runs on FOSS - Wordpress, MyBB on Apache web server.